Google: The home of happy news? 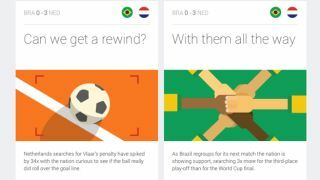 The Google Trends-powered World Cup social news experiment deliberately avoided heaping more embarrassment on the Brazilian nation, by focusing on happier stories, it has been revealed. During the tournament a Google team has been analysing search requests during World Cup games and using the top queries to create easily sharable news items, but with a focus on more uplifting elements. So, while Brazilians trended towards word 'shame' in their searches following the 7-1 semi-final humbling at the hands of Germany, Google left that item on the cutting room floor because it was just too negative. In an NPR report from inside the Google newsroom, copywriter Tessa Hewson said: "We might try and wait until we can do a slightly more upbeat trend." "We're also quite keen not to rub salt into the wounds and a negative story about Brazil won't necessarily get a lot of traction in social," producer Sam Clohesy added. Instead of Brazilian shame, Google focused on the pragmatism of German searches by posting: "With Germany leading Brazil 5-0 at half time, Germany searches for "highest score in a World Cup victory" spiked by 370x." The short Google Now card-like posts in the main offer interesting tidbits that viewers are encouraged to share on social channels. The experiment's willingness to avoid bad news is interesting, as negative news almost always supersedes the positive, but Google claims is isn't skewing traditional news values. In a statement, the company said: "Our social channels exist to share interesting and relevant information to the people who want to hear from us. Unlike your average 16-year-old, we don't share every single thing we might have to say. Throughout the World Cup, we've shared more than 150 tidbits in 13 languages looking at Leaping Legends to Waving the Flag and everything in between. If people want more, they can always use google.com/trends to see what topics are trending at that time. Our primary goal, more than anything else, is to share what matters most at that moment to the most people. And, it's good to have that goal, as we don't want to have to rely on penalty kicks." The question is, would the evening news be a sunnier place if Google were setting the agenda? Share your thoughts in the comments below.